Field number WR 640 (Collector Walter Rausch) Pucara, North Cinti, Chuquisaca, Bolivia, 3200 metres above sea level. Origin and Habitat: North Cinti, near Pucara (and adjacent areas), Chuquisaca, Bolivia (Western South America). Altitude range: 2800-3200 metres above sea level. Stem: Globose to short-cylindrical, to 1.5 cm wide, green. Areoles: Elongating with short brown wool. Radial spines: 17-19, pectinate, lying flat to the body, 1 to 2mm long, glassy white to honey yellow, slightly pubescent. Central spines: Usually not present, but occasionally there is one, similar to the radials. Flowers: Orange, 3 cm long, 2.5 cm across. Outer tepals pink with brown midstripe. Inner tepals shining orange, with pinkish-white throat. Stigma greenish. Remarks: The few specimens occasionally found in cultivation, even in spite of diligent transfer of the pollen amongst them, fail to set seeds. May be, all them are cuttings of the only clone available in cultivation. 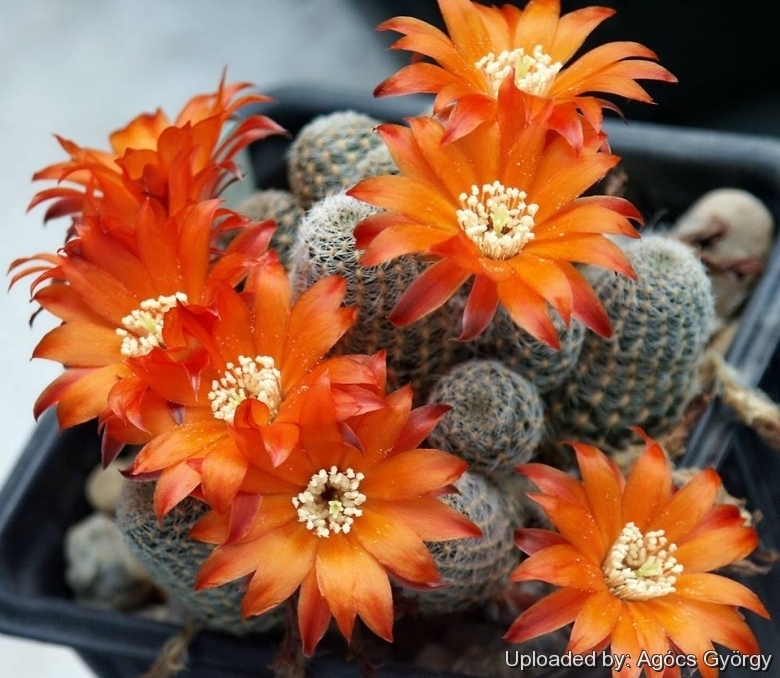 Cultivation and Propagation: Rebutia schatzliana comes from mountainous areas, so like bright light, and cool and dry conditions in the winter. It has delightful flowers and the plant remain compact, and clumps can easily be managed by division. It is easy to cultivate and recommended for beginners. Soils: This species is easy to cultivate in a very open mineral mix with at least 50% sand or pumice grit and a pH slightly on the acidic side. Repotting: They are small container size plants and prefer deep pots and good drainage to accommodate their tap roots, but they rot prone, because of the sensitivity to excess of watering, not easy to get to any large size on their own roots (it's really a challenge to grow them into a large clump). They will occupy a small pot comfortably, and eventually remain a manageable sized house plant. It is better that they are repotted regularly. Repotting will increase the number and size of stems, and will increase the number of flowers produced. Repot yearly until they reach about 100 mm in size, then every two or three years will suffice. Repotting is best done at the end of winter, but can be done at other times, too. Do not water for a couple of weeks after repotting, to reduce risk of root rot via broken roots. A layer of 'pea' gravel at the bottom of the pot improves drainage. A layer of decorative gravel as a top dressing helps prevent the caking of the potting mix, which decreases the rate of water absorption. It also keeps the perlite and pumice from blowing everywhere, and looks nice. Watering: It requires full sun or light shade and careful watering to keep plant compact, and maintain strong and dense spines and allow the pot to dry out between waterings. Keep dry in winter at a minimum temperature of 0°C. It tends to rot if too wet. The plants can be placed outdoors in April, but protected from rain and direct sunlight. Water them thoroughly when placed out, and again in two weeks, and again in one week. After one month the plants are ready to be placed out in full sun and full rain for the summer. During dry spells the collection is watered once a week, during hot dry spells, twice a week. Hardiness: It is reputedly resistant to frost if kept on the dry side prior to, and during, cold weather and requires a winter rest period (hardy to -7° C, or less for short periods). Rebutias grow in nature at high altitudes, and do not thrive well at high temperatures in cultivation. They will often go dormant in mid-summer, and resume growth again when the weather cools in late August. They can tolerate amazingly low temperatures for long periods of time. All species can take a frost, even when not bone dry. It is generally accepted that plants kept at too high a temperature, or watered too much during the winter rest period, will not bloom the following year. They will be perfectly happy in pots outdoors from April to September if protected from torrential rain and hail. Uses: It is a fine plant for a rock garden or container, contrasts well with agaves, yuccas, and low-growing flowering plants. This variety is also likely to flower as a house plant, but results will depend on a variety of growing conditions. Pests & diseases: All, especially the young, are susceptible to red spider mites. Rot: It is especially prone to root rot, therefore, underpot in a smaller container filled with very porous compost. However rot it is only a minor problem with rebutias if the plants are watered and “aired” correctly. If they are not, fungicides won't help all that much. Propagation: Offsets, seeds (seldom available in cultivation). To make a cutting twist off a branch and permit it to dry out a couple of weeks, lay it on the soil and insert the stem end partially into the soil. Try to keep the cutting somewhat upright so that the roots are able to grow downward.